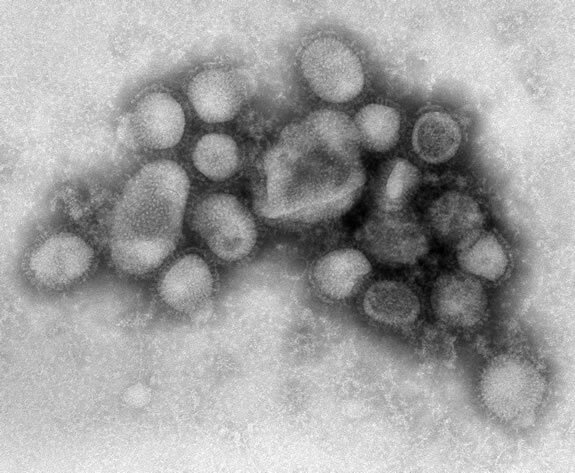 That, folks, is a picture of the H1N1 influenza virus – just in case you were wondering what it looks like. Barely a week ago, I hadn’t heard of the so-called Swine Flu and was happy in my ignorance. Since then, I’ve visited my sister and her beautiful new baby; juggled work, kids and travel in a very packed weekend and ended up quarantined in my house for fear of spreading a potential infection to my friends and neighbors. What a whirlwind! If, like me, you’re feeling a little overwhelmed by the torrent of information on this topic and can’t really remember the sequencing of events, there’s a really useful Swine Flu Timeline interactive tool on the Fox News website. For this post, I’m going to focus on our experience and hopefully provide some insight to other families who are considering whether or not to postpone travel plans between now and whenever this pandemic abates. I vaguely recall hearing something about an outbreak of flu in Mexico City on Friday, April 24th as I drove to work. Since we weren’t flying through Mexico City, I didn’t pay much attention to the story. At 6pm that evening, I was running through my packing lists and chiding my boys to make sure they had what they needed for the trip in their backpacks. We dashed to the airport with little time to spare before our red-eye to Guadalajara (via LAX) and didn’t even catch the evening news. we arrived in Guadalajara at 7am Saturday, April 25th. There was nothing remarkable about passport control but I noticed that the customs staff were wearing gloves and facemasks as they checked bags. When we got to our accommodation, I worked for a few hours as my husband and children slept. Then we spent a quiet day by the pool with family. In the evening, we had dinner at a local restaurant on the plaza in Ajijic. There wasn’t a facemask or surgical glove in sight. Early Sunday morning, April 26th, my sister mentioned to me that the staff at a local store were wearing masks. Given that I hadn’t read a newspaper or heard the news since Friday morning, I was probably more than a little arrogant when I brushed her off with a “Oh, it’s just a big fuss over nothing!” We spent the afternoon exploring Tlaquepaque, blithely unaware that schools and other public locations had been shut down in Mexico City and that the WHO had announced that the world was facing a swine flu pandemic. But later that evening, listening to the evening news on CNN, I started to get concerned. On Monday, April 27th, WanderDad and I talked about whether or not we should mention the pandemic to our boys. My sense was that since we likely hadn’t been exposed, talking about it might scare our children and so we shouldn’t bring it up unless it was really necessary. WanderDad disagreed but given that we were eager to start our journey to Colima, we let the matter drop. Later that day, when we sat to dinner at the restaurant in our hotel, the waiter brought facemasks to our table. So much for ignoring the topic in front of the children. Tuesday, April 28th was a busy day. After breakfast, we talked about the flu with CAM and BigB. They were, as WanderDad had predicted, more fascinated by the science than scared by the possibility of becoming infected themselves. We emailed a friend in Seattle who is a nurse and asked for advice on protecting ourselves and whether or not there was anything we should do during or after our flight home the following day. As we waited for her response, we realized that if there was any possibility that we had been infected, we would have to be careful not to spread the virus when we returned to Seattle. We emailed the children’s schools to get their input. (The kids were thrilled that they might have two extra days off school!) Emails were flying back and forth furiously: don’t bother with facemasks; make sure to use an alcohol-based hand sanitizer frequently and liberally; stay away from crowded places; yes, the schools would like us to keep the boys at home; yes, we should stay in our house for 3-5 after we returned and monitor for any flu-like symptoms. And then, just as quickly as we’d arrived, it was time to go home. The airport in Guadalajara was pretty busy when we checked in for our early morning flight. Now it seemed that everyone, staff, officials and passengers, was wearing a facemask. We joked about being quarantined on our arrival into LAX, but our trip home was completely painless. The most interesting part of this whole experience was being able to observe how people were reacting to the news as it broke around us in Mexico and then deciding how to communicate with our children about what was happening and why. With an on-the-ground perspective, it seemed that the level of reporting on the flu was out-of-proportion to the size of the problem and that this was causing unnecessary alarm. What worked best for the children was to talk to them calmly about the issue. Since we don’t speak Spanish, we were also protected from the impact of the media coverage. I can’t say for sure that this helped, but my sense is that it did because we were able to control the message to our children and avoid any undue alarm. CAM obviously wasn’t too perturbed by the whole experience. He woke me on Thursday morning, wearing a facemask holding out this book (in gloved hands), open to the page on “How to Survive a Flu Pandemic”! Will we change our travel plans for the rest of this year because of swine flu? I don’t think so. We will, if possible, avoid places where contagion seems more likely – although currently that seems to be just Mexico City. It seems to me that during the rest of this year it’s important to practice the things which you would normally do to stay healthy during the regular winter flu season: cover your mouth and nose when you cough or sneeze and wash your hands frequently. If you usually spend the winter indoors worried about catching the flu, then maybe you should stay indoors now. If you don’t, well then, what are you waiting for? It’s a great time to travel! This entry was posted in International Escapades, Mexico and tagged Ajijic, Colima, Guadalajara, Mexico, Swine Flu on May 4, 2009 by wandermom. 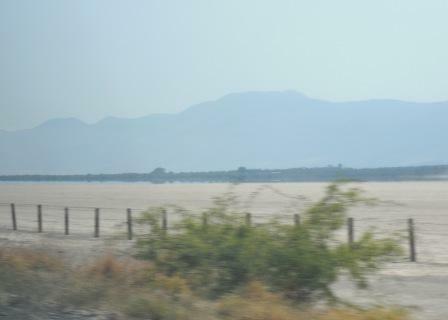 Last weekend, we visited the Lake Chapala area of Mexico. The focus of our trip was to assist with a family matter and since we were only in the country for four days, our general plan was to hang out with family while the kids played in the pool. We knew that we’d have a long drive from Ajijic to Colima, but we hadn’t even researched the route we’d be taking. We absolutely did not expect the spectacular sights we saw along Highway 54. 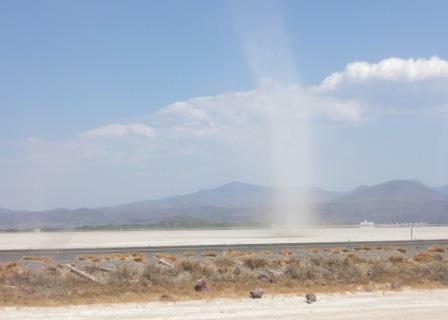 In the first half of the three-hour drive, as you drive through the dry lake beds of Laguna Sayula and Laguna San Marco, the dust devils are amazing. For my children, this became a competition in who could spot the best, biggest, devil. As we drove along, I commented on the reflection of the mountains in what seemed to be some shallow water on the horizon. We very quickly realized that there wasn’t any water at all and that we were actually seeing a mirage. The boys were transfixed. I was stunned and not really sure that it really was a mirage. But, sure enough, as we drove closer, the “water” receded. If you look closely at the photo above, it appears that the lower ridge of trees and shrubs is reflected in the water. It’s not. I had never really appreciated how authentic a mirage could be. My children, of course, would never have been able to see this in a classroom. We have a family habit of playing tourist in our own city the day after we return from a trip to let ourselves down gently from the fun of traveling together. This wasn’t an option after this trip: we didn’t play tourist today, in fact, we’re self-quarantining in our house for a few days because we’re not sure whether or not we’ve been exposed to Swine Flu. Being in Mexico as this situation developed was a fascinating experience especially as a mom who writes about traveling with children. I’ll be writing more about this experience next week once I know we’re all safe and healthy. This entry was posted in International Escapades, Mexico and tagged Ajijic, Colima, Laguna San Marco, Laguna Sayula, Lake Chapala, Mexico, Swine Flu on April 30, 2009 by wandermom.